But this visit was a gift from her dear mother for her 30th birthday. Luckily for her, the gift card was for a particular package which meant she would not be gaping like a fool at the exorbitant rates. Once again, Diya tried to relax telling herself that these women were being paid by her. She employed them and as much as she was sure they were secretly laughing at her naiveté, Diya wasn’t the one working for a living. But deep down in her heart, she knew she was not the type to walk confidently into an exclusive spa like she owned the place. Not like that other woman. Diya’s head had been inside a steaming machine - it was supposed to make her hair soft, although she was dubious - and so she hadn’t been able to look at her. But from the little she had overheard, it was obvious that the woman came here regularly. The receptionist had been practically gushing over her, a marked difference from how Diya had been received an hour earlier. This woman probably looked down her nose at the receptionist, not the other way round! The chair next to her suddenly shifted and she sensed that someone was now sitting next to her. A confident voice remarked, ‘It’s so tiresome to sit here with a pack on your face isn’t it?’ With a jolt, Diya realized it was the woman who had come in earlier. She made a suitable reply and pretty soon, they were chatting away nineteen to the dozen. Her name was Nihar and she worked for a popular IT firm. She came here at least once a month - to relax, as she put it. Diya wondered what it must be like to not worry about money, to be able to spend on anything without having to give an account to someone else. She came from a conservative family, where women stayed at home and looked after the children. She’d gone to college but that was only to be educated not to get a job. That was a man’s domain. She used to feel pity for women who had to work but not anymore. The world had changed a lot since then. 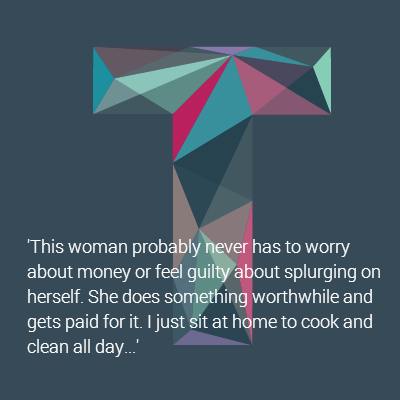 Diya knew firsthand the difficulties of running a household on one income, especially on a government salary. True, her husband would get a comfortable pension and healthcare for life after retirement but that didn't help with the demands of modern city life. It had been a mistake to send the girls to a 'posh' school but she'd realized it too late. Between school and bus fees, they couldn't afford money for extras like pizza or swim lessons. Before long, her little girls would be teenagers asking for pocket money because all their friends were getting one. And then what was she supposed to do?